A commemorative plaque erected in 1980 in recognition of the services rendered by the flying boats from 1938 to 1974. Flying boats hold a special place in the transportation history of Sydney. A flying boat is an aircraft that can take off and alight from water, as the main body of the plane is a hull that rests fully on the water. They were primarily designed to carry first class mail and were well suited to working on Sydney Harbour. A base was built at Rose Bay that included a large hangar on land, with slipways and terminal facilities for the boats and passengers. The official opening of the Rose Bay airport, by Lord Huntingfield, Acting Governor General, was on 4 August 1938. By the early 1950s, with the arrival of jet airliners, the gradual demise of the flying boats began. In 1955 Qantas discontinued its flying boat service and sold its aircraft to Ansett Airways, Ansett Flying Boat Services operated flights to Lord Howe Island and Norfolk Island from the 1950s, until the service was discontinued in 1974. 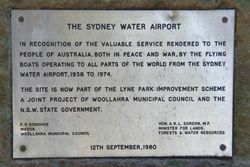 IN RECOGNITION OF THE VALUABLE SERVICE RENDERED TO THE PEOPLE OF AUSTRALIA BOTH IN OPEACE AND WAR , BY THE FLYING BOATS OPERATING TO ALL PARTS OF THE WORLD FROM THE SYDNEY WATER AIRPORT, 1938 TO 1974. 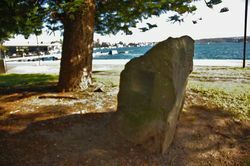 THE SITE IS NOW PART OF THE LYNE PARK IMPROVEMENT SCHEME A JOINT PROJECT OF WOOLLAHRA MUNICIPAL COUNCIL AND THE N.S.W.STATE GOVERNMENT.